Sunday December 13th 1896 It was cloudy all day but did not rain. We went to church in the forenoon and read in the afternoon and evening. Monday December 14th 1896 Will took chickens to town in the morning. Bob helped me wash, Did churning and house work all afternoon. Tuesday December 15th 1896 Will took chickens to town again this morning. I was ironing and doing baking, busy all day. The boys finished hauling fodder. Wednesday December 16th 1896 Will took down more chickens. I dressed a duck and got the dinner. sewed on carpet in the afternoon. 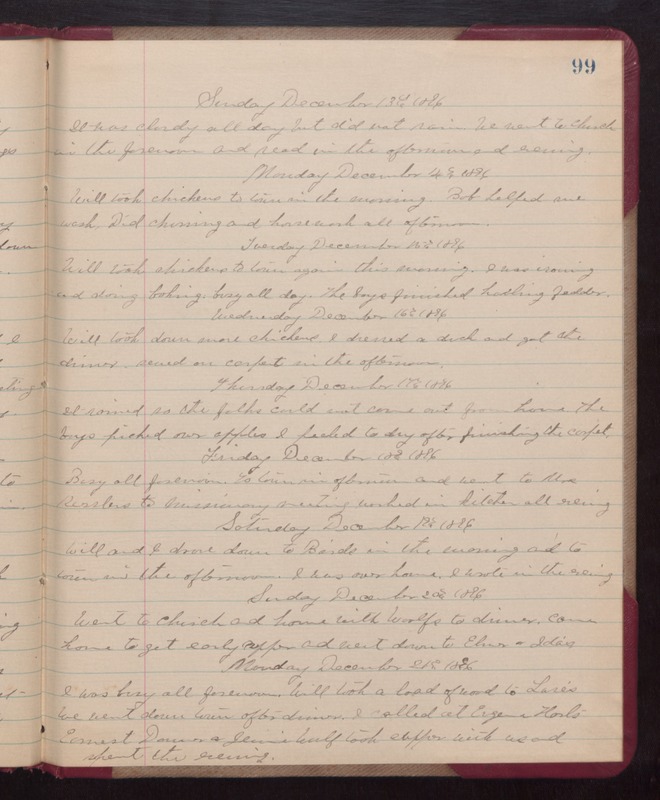 Thursday December 17th 1896 It rained so the folks could not come out from home. The boys finished our apples. I peeled to dry after finishing the carpet. Friday December 18th 1896 Busy all forenoon. To town in afternoon and went to Mrs Kesslers to missionary meeting. worked in kitchen all evening. Saturday December 19th 1896 Will and I drove down to Birds in the morning and to town in the afternoon. I was over home. I wrote in the evening. Sunday December 20th 1896 Went to church and home with Woolfs to dinner. Came home to get early supper and went down to Elmer & Idas. Monday December 21st 1896 I was busy all forenoon. Will took a load of wood to Luse's. We went down town after dinner. I called to Eugene Harts. Earnest Danner & Jennie Woolf took supper with us and spent the evening.